Karl Rove was at war with grassroots conservatives a few months ago. Now he’s defending them. Why? 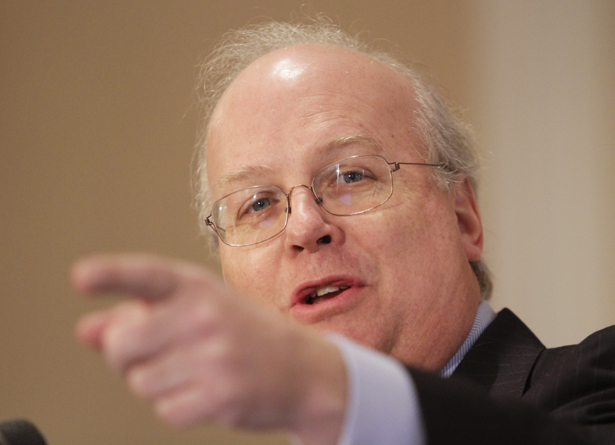 Karl Rove is offering America a super-sized serving of political cynicism. Since the controversy over the targeting of grassroots tea party groups for extra scrutiny by the Internal Revenue Service arose, Rove has engaged in the sort of political sleight of hand that could only be practiced in a country where elite media have no skepticism—and no memory. Just a few months ago, after the 2012 election, Rove was widely portrayed as having declared war on grassroots conservatives in general and the Tea Party movement in particular. The former White House political czar was frustrated: During the 2010 and 2012 election cycles, Republicans had been positioned to win control of the US Senate. Yet, in each cycle, they fell short after the party’s grassroots activists upended the candidacies of relatively more moderate candidates in Republican primaries. The Tea Party favorites frequently proved to be weaker contenders and—in the cases of candidates such as Delaware’s Christine O’Donnell in 2010 and Indiana’s Richard Mourdock in 2012—were seen as having snatched defeat from the jaws of certain victory. What a difference three months makes. You would have thought Karl Rove was a Tea Party Patriot himself. Rove is playing a particularly cynical game. He recognizes that there is going to be a Tea Party movement—and that it may actually be stronger as a result of the current controversy. And he knows that the grassroots groups that are seeking tax-exempt status are unlikely to be able to counter the financial and strategic might of his American Crossroads combine. So Rove is joining the outcry on behalf of the little folks, recognizing that he can only benefit by being seen as an ally of conservative activists who, before they were enraged with the IRS, were enraged with Karl Rove. But there is more going on than mere “The Enemy of My Enemy is My Friend” positioning. This is where Rove’s shows his smarts. He understands that the current wrangling over the IRS is going to result in changes, some of them structural, some of them relating to the focus and intensity of inquiries into alleged abuses by tax-exempt groups. Everyone who has steered a 501(c)4 into the political fray— conservativesand liberals; Republicans like Rove and Democrats with close ties to President Obama—knows that the best possible circumstance for them is one where the rules governing political activity by supposedly “charitable” groups are weak and unclear. And it gets even better for Rove and his ilk if battered-and-bruised IRS agents are disinclined to challenge any individual or group that might accuse the agency of targeting them. Rove recognizes that the real debate is not about whether discrimination based on political ideology will be aggressively addressed and appropriately constrained. That’s going to happen, as it should. The Congress and the White House will see to it; indeed, President Obama sounds every bit as ardent on the issue as Speaker John Boehner, R-Ohio. The question that remains is a bigger one. Will Congress and the Federal Election Commission establish clear and unequivocal standards that IRS auditors can follow? Will we finally, in the aftermath of the Supreme Court’s Citizens United v. FEC decision, and a host of other rulings, have some definition of the new political playing field? That definition would, necessarily, be fair to conservatives and liberals, Democrats and Republicans. But it could still place limits on the ambitious activities of Mr. Rove and his compatriots on both sides of the political aisle. Only the most naïve observer would imagine that Karl Rove is concerned with protecting the grassroots activists with whom he was so recently sparring. Every evidence suggests that it is Rove’s plan to thwart their activism in 2014 and beyond. What concerns Rove is taking advantage of a political moment. A master of gaming whatever opening occurs, Rove is busily attacking Democrats in the Senate and President Obama for having suggested that clear standards ought to be established. [Thanks] to a Supreme Court decision called Citizens United, they are being helped along this year by special interest groups that are spending unlimited amounts of money on attack ads… just attacking people without ever disclosing who’s behind all these attack ads. You don’t know. It could be the oil industry. It could be the insurance industry. It could even be foreign-owned corporations. You don’t know because they don’t have to disclose. Now, that’s not just a threat to Democrats—that’s a threat to our democracy. Every American business and industry deserves a seat at the table, but they don’t get to a chance to buy every chair. We’ve seen what happens when they do. They put the entire economy at risk and every American might end up suffering. So you can’t let it happen. Don’t let them hijack your agenda. The American people deserve to know who’s trying to sway their elections. And you can’t stand by and let special interests drown out the voices of the American people. Just days before Obama spoke, in October, 2010, an effort to advance the legislation had failed by one vote in the Senate. It is hard to imagine a better circumstance for Karl Rove than one in which any effort to control the flow of corporate money into the political process, and to assure at least a measure of transparency, is decried as somehow inappropriate. Then, Rove would be a man without limits. He could use his vast resources to beat the candidates favored by grassroots conservatives in Republican primaries and to secure November victories for his favored contenders. Then the threat to democracy that the president described would be complete—as sincere activists on the right and the left would be shunted to the sidelines of a new political landscape where corporate cash decides the day and the boss is not a CEO but a cynical political operative named Karl Rove. How long will Arizona deny driver’s licenses to immigrant youth? Read Aura Bogado’s take.